Beautify your home with a new fence! Selling your home? Looking to spruce up your property? A simple way to increase your home’s curb appeal without breaking the bank is to line your yard with a fence that’s both beautiful and functional. A great fence frames a yard while still keeping out potential vandals and unwanted solicitors and keeping your pets and kids in. How do you choose the right fence that will offer you both practicality and curb appeal? The stereotypical fence most people have in mind when they describe their dream home is a white picket fence. Even if it isn’t at the forefront of a prospective homebuyer’s mind, it isn’t a stretch to say that somewhere in their subconscious they have the image of a beautiful house framed with a white picket fence. Picket fences are traditionally white or natural wood, although they can be stained or painted to compliment your house or landscaping. A picket fence with a fresh pop of color can set your house apart from others on your street and add major curb appeal. These fences are typically 2 to 4 feet high, but can be adjusted in height to match your needs. 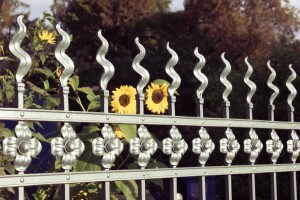 Wrought iron fences can add a touch of elegance to homes both new and old. Traditionally used by the wealthy, they have been used for centuries to perfectly frame houses with an air of sophisticated mystery. Many neighborhoods with historic homes already have wrought iron fencing and welcome it. Take your time choosing the right scrollwork and design to match your home instead of masking it. For those that love the style of wrought iron without the intimidation, you can easily paint your fence any color of your choosing. Proud of your landscaping? Consider painting your fence a lush green to both blend in and compliment your greenery to add some real curb appeal. Natural fencing can take a good amount of time to plant, grow, and sculpt to your liking, but it’s the perfect solution for someone wanting the look and benefit of a fence without using metal or wood. The fencing is made from a biodegradable and environmentally friendly mesh core that is woven with vines to make a standalone structure. These fences are usually 3 feet high. While many types of vines can be used for natural fencing, wisteria, honeysuckle, and the nasturtium cultivar “Empress of India” are excellent for upping your curb appeal without closing your yard off too much. Split rail fencing can perfectly compliment your country home or bring the country to you! Split rails require low maintenance and few materials while still framing your yard and raising your curb appeal. If you have any damage or wood rot along your fence as it ages, you can simply replace that single rail instead of having to redo entire sections. Split rail fencing also offers a surprising number of color options when you consider all of the woods and wood stains available on the market. Is Your Yard Ready For Curb Appeal? This entry was posted on Friday, June 17th, 2016 at 9:35 pm. Both comments and pings are currently closed.